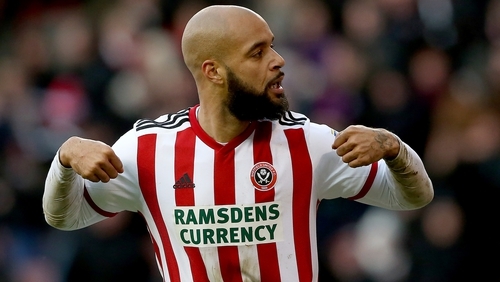 Republic of Ireland striker David McGoldrick struck his 11th goal of the season to ensure Sheffield United kept the pressure on the top two in the Championship courtesy of a 2-0 victory over Bolton at Bramall Lane. With leaders Leeds facing fellow high-flyers Norwich in the evening kick-off, the Blades knew they could make ground with a win. And they did just that as McGoldrick and Billy Sharp - netting his 20th goal of the campaign - left struggling Bolton three points from safety. The hosts jumped up to second, three points off Leeds. Another Irish attacker, Scott Hogan, who joined Sheffield United on loan from Aston Villa on Thursday, was on the bench but did not feature. Meanwhile Callum O'Dowda got himself on the score-sheet as Bristol City surged into the top six, leapfrogging Derby, with a 2-0 triumph over Swansea at Ashton Gate. Second-half goals from Andreas Weimann and O'Dowda secured the Robins their seventh consecutive win in all competitions. Jay Rodriguez and Dwight Gayle netted for the Baggies, who trailed to George Saville's 17th-minute opener. But Assombalonga, a 65th-minute substitute, made an impact with a brace in the final 15 minutes. Jota and Che Adams powered Birmingham to a 2-0 win over Martin O'Neill's Nottingham Forest, who had Yohan Benalouane sent off late on at St Andrews, while Reading and Aston Villa drew 0-0 at the Madejski Stadium. Jarrod Bowen's free-kick put Hull ahead in the 44th minute, his 15th goal of the campaign, just before Vokes failed to score from 12 yards, with Kamil Grosicki adding a second for City in the 64th minute. Bottom-placed Ipswich are eight points adrift of safety after Lucas Joao's last-minute goal secured Steve Bruce a 1-0 win in his first game in charge of Sheffield Wednesday at Portman Road.